Make your spouse feel like he is on vacation. Serve him this breakfast on a weekend, and he will adore you. Simmer apples in Chardonnay until fork tender. Add Maple Syrup, warm. 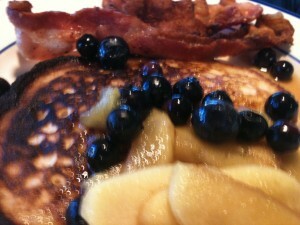 Lastly add fresh blueberries. 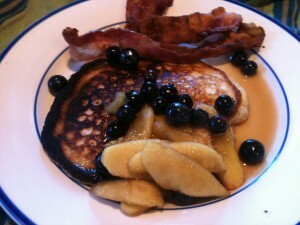 This entry was posted in Breakfast, Brunch, Sauces and tagged Apples, Blueberries, maple, SYRUP. Bookmark the permalink.